Hyderabad, January 15: “The government of India is working a vision to develop Eklavya Model Residential Schools on par with the Navodaya vidyalays with a focus on overall development of tribal students, besides huge budgetary allocations”, said the Minister of State for Tribal Affairs, Jaswantsinh Sumanbhai Bhabhor inaugurating the first Eklavya Model Residential Schools Sports meet at Gachibowli stadium in Hyderabad yesterday. 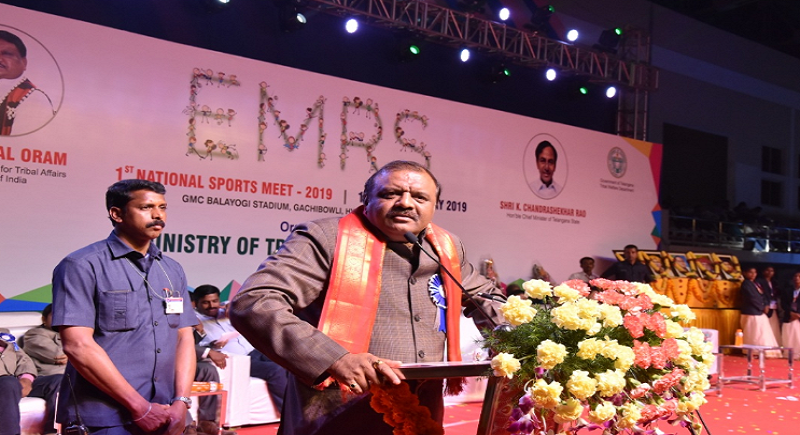 The National Sports Meet is being held from 14th to 16th January 2019 where the Telangana State has been chosen as the host for the Meet being organised by Tribal Welfare Residential Educational Institutions Society. It is according to the minister that the government of India is planning to establish more than 400 Eklavya model schools by 2022. Huge investments in the education sector have been provided by the Telangana CM in order to provide quality education to Tribal children in the state. “1735 participants from 20 States across the country are expected to exhibit their talent in various Events in the Meet. There will be 13 events including Athletics and in Athletics there will be 13 different competitions such as various Runs, Jumps and Walks.”, reported the statement. The objectives of the EMRS constitute comprehensive physical, mental and socially relevant development of all students enrolled in each and every. Students will be empowered to be change agent, beginning in their school, in their homes, in their village and finally in a larger context.Support the construction of infrastructure that provides education, physical, environmental and cultural needs of student life is also of a prime focus of the centre. Deepak Khandekar, Secretary, Tribal Affairs, Vinod Kumar Tewari, Joint Secretary along with various secretaries, advisors, directors, under secretaries and other dignitaries were present on the occasion.